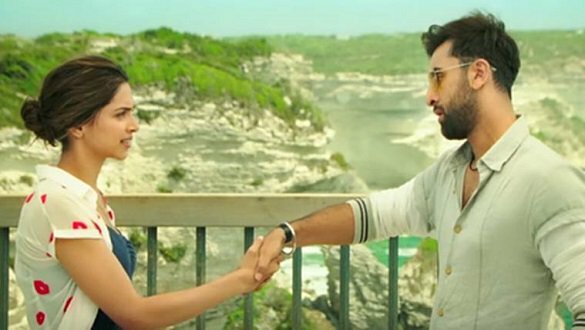 Imtiaz Ali directs Ranbir Kapoor and Deepika Padukone in Tamasha, in a love story that promises to be unlike other love stories. Bold aspirations indeed, seeing how Imtiaz has directed Ranbir in the angst filled Rockstar, Ranbir has played the rebel with a cause, the one who goes against the grain, Also Deepika has played the counterbalance to Ranbir in a fair few times. But therein lies the magic. You take ingredients that have worked on some level or the other and you refine them over the course of time and what you get is a concoctions that has the sparks of magic flying through it. 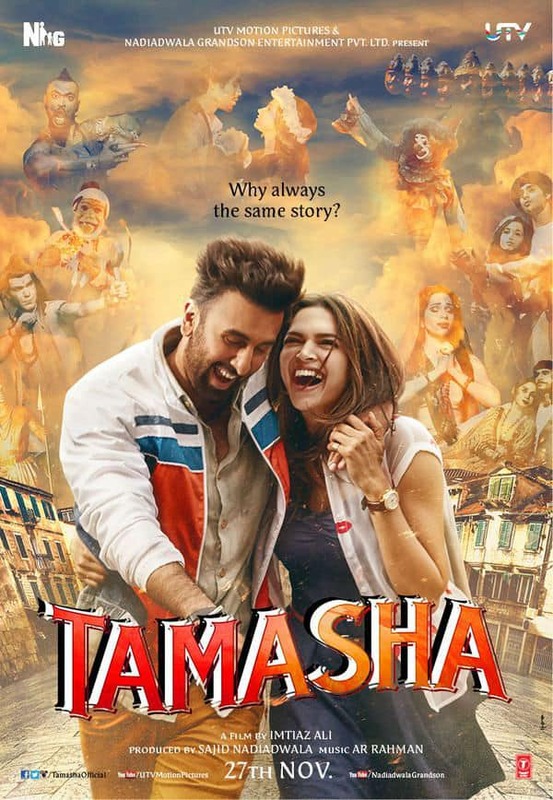 To dissect Tamasha into its four acts is simple but look a little deeper and you can see what each of those acts represent. Human life is divided into 4 stages or Ashrams, Bramhacharaya Ashram, Grihasta Ashram, Vanprasta Ashram and Sanyasa Ashram. Each of the Ashrams represent a central pursuit or struggle. Teja ka Sona is Ranbir living out his Bramhacharaya Ashram – we meet the young Ranbir who admittedly is rubbish at maths but loves spending his time listening to stories from an old man who sits under a tree in Shimla. We see him grow up and meet Deepika Padukone in Corsica where they decide to not exchange identities and instead live out their days together feigning different Bollywood stereotypes while slowly falling for each other. They agree that what happens in Corsica stays in Corsica. Here Imtiaz also takes us on a Richard Linklater style Before Sunrise journey where two strangers meet but where Ethan Hawke and Judy Delpy had the power of words here a lot more is said in the moments where not a word is spoken. A few years pass and we enter Grihasta Ashram. In Ishq Wala Love we meet a domesticated Ranbir aka Ved. Deepika and Ved meet and go through the motions of falling in love but something is missing –And in one fell swoop Imtiaz skips Before Sunset and takes us straight into Before Midnight territory where the illusion of love comes crashing down. Andar Ki Baat is Ranbir’s Vanprastha Ashram. As he slowly self-destructs first by displaying schizophrenic behaviour in business meetings and then an outright bipolar behaviour as he finally breaks the chains that are binding him. With Don Returns Ranbir enters Sanyas Ashram with divine realisation upon him he finds his driving force and realises his true potential. Imtiaz Ali is a master of parent child conflict and he has played on this from several angles starting with Jab We Met to Rockstar and now again with Tamasha. He treads a fine line of becoming too preachy and manages to strike a balance between the pent up angst that Ranbir feels as a child, as teenager and then as a young man and the reconciliation that finally happens when he finally opens up to his father. The opening sequence featuring a Tin-man Ranbir is a masterstroke. What may appear as jarring and out of place and narratively disjointed is reminiscent of the iconic Apple ad of 1984. There is a line towards the end of the movie which is dropped in very casually “the bipolar behaviour of the modern consumer” this is how you need to view the movie – the bipolar behaviour where you internalize your true desires and externalize what is socially expected and accepted. There is a constant struggle that every individual goes through and while it is heightened in case of some individuals like in the case of Ranbir here, I am sure everyone can find something to relate to. Deepika Padukone just keeps getting better with every movie. Here she is brilliant in more of a supporting role to Ranbir, her rambling school girl moment when she runs into Ranbir the second time is so perfect that you feel her exhilaration and embarrassment at the same time. Ranbir Kapoor is perfectly cast as Ved, his restraint when he vents his frustration. His polite and proper Ved is just as meticulous then when he unravels and spirals out you see the dual personalities coming out and you see feel his struggle as the two Veds try to overpower one another. Seeing this side of Ranbir makes me yearn for him to an outright dark role he certainly has the chops for it. Like American Psycho or something on similar lines it would be Fan-freaking-tastic. A R Rehman’s last collaboration with Ali was pure cinematic magic with Rockstar, here the songs are not that memorable nor easily hummable except perhaps Mattargashti and Heer is Sad but they are more lyrical and aid the progress of the story. S Ravi Varman’s work behind the camera isn’t as quirky and enticing as Barfi! But he brings a dark energy to when Ranbir is going through dark times, there is a lightness when he shoots the sequences in Corsica and then the scenes which are a parallel narrative with the Rickshaw driver who sees himself as a singer, the theatre scenes they have a Gasper Noe’s Enter the Void like psychedelic energy. I really fail to see why this movie is getting mixed review or even negative ones. This for me rights the narrative wrongs of Rockstar where the female lead was poorly written. This is brilliantly acted and meticulously directed, in times of remakes and superstar vehicles where nothing other than the names on the playbill matter this is a movie that stands strong on its brave approach to storytelling.